A buy and hold strategy, sometimes also referred to as a buy and forget strategy, is a type of investment strategy where investors do not actively manage their portfolio. As such, buy and hold is an example of a passive strategy. On this page we discuss the advantages and disadvantages of a buy and hold strategy. Buy and hold investing is built on the premise that it is not possible to time the stock market. Buy and hold investors are of the opinion that investors cannot accurately forecast turning points in the stock market. Instead, buy and hold investing argues that when stock market corrections occur, it is better to leave the portfolio as it is. Buy & hold investors also advocate to hold stocks for the long term. This allows investors to ride out periods where stocks underperform. 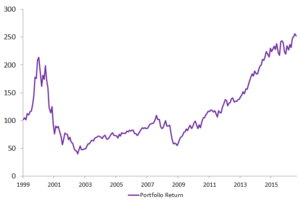 The ultimate buy and hold strategy should therefore have a portfolio turnover rate of zero. Investors who employ the buy and hold investment approach do not execute a lot of trades. This has the advantage that these investors do not incurr any transaction costs. To calculate the return of a buy and hold strategy, we can calculate the time-weighted return. The time-weighted return is also sometimes referred to as the buy and hold return, since it measures the return of a buy and hold investor. Time-weighted returns can easily be calculated using Excel. There are also some potential disadvantages to a buy and hold strategy. For example, buy and hold requires that investors can suppress their behavioral biases and they can handle the emotional impact of drawdowns. This implies that, while buy and hold is easy to implement for an unsophisticated investor, is not an easy strategy to follow correctly. When implementing a buy and hold strategy, it is important to be well-diversified. One way of having a well-diversified portfolio, is buying an index tracker or Exchange Traded Fund (ETF). while such a strategy will not allow investors to beat the market, they will nevertheless earn a return very close that the market return without almost any effort. 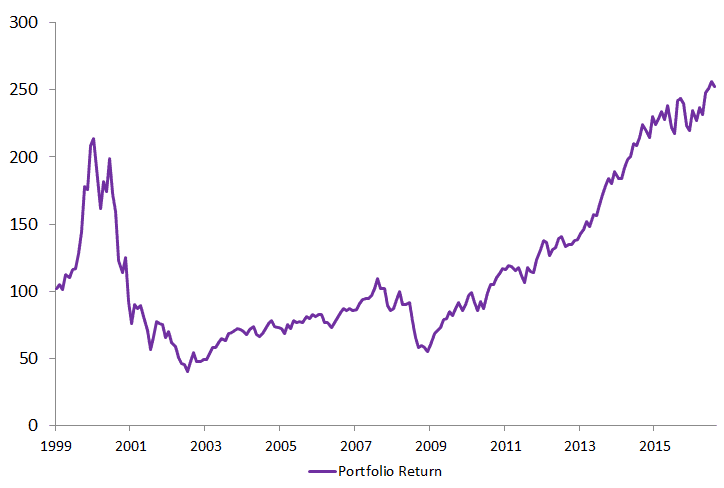 Alternatively, investors can choose to construct their own portfolio, using a risk parity or MPT approach. Buy and hold does not only apply to stocks or bonds. It can also apply to real estate. Buy and hold real estate investing means that investors purchase houses without flipping them. Typically, the investor will take a mortgage to make use of leverage. We discussed the buy and hold strategy, which is ideal for unsophisticated investors that do not have time to follow-up on their portfolio often. Buy & hold investing incurs very low transaction costs and allows investors to earn the market return.